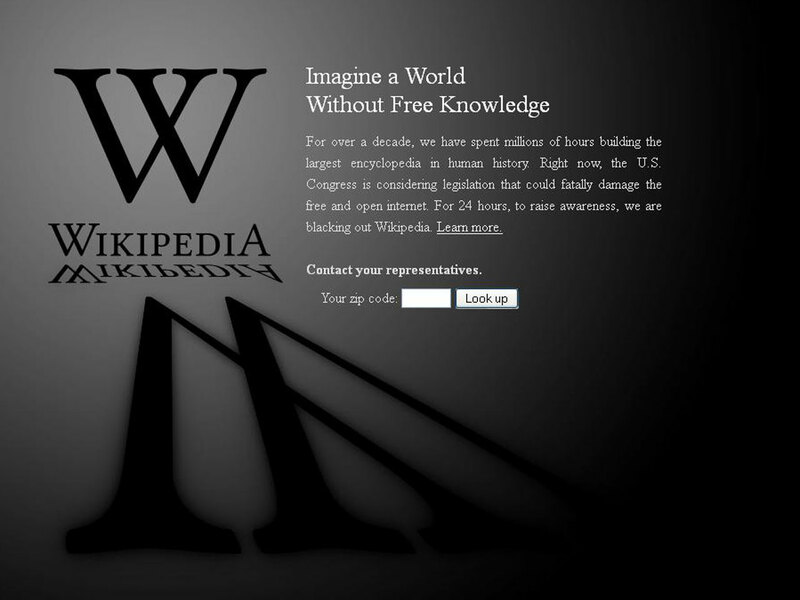 Having trouble using Wikipedia today? That's because the popular crowd-sourced online encyclopedia is participating in an "Internet blackout" in protest of two controversial anti-piracy bills: The Stop Online Piracy Act (SOPA) and its Senate companion, the Protect IP Act (PIPA). The bills are intended to strengthen protections against copyright infringement and intellectual property theft, but Internet advocates say they would stifle expression on the World Wide Web. In essence, the legislation has pitted content providers -- like the music and film industries -- against Silicon Valley. CBS Corporation is among the media and entertainment companies that support the legislation. "It's not a battle of left versus right," said progressive activist Adam Green, whose organization Progressive Change Campaign Committee on Tuesday hosted a press conference with opponents of the bills. "Frankly, it's a battle of old versus new." Here's a basic look at the actions taking place today and the legislation causing all the fuss. The popular link-sharing site Reddit got the ball rolling for today's 24-hour Internet blackout. In addition to Reddit and Wikipedia, other sites participating include BoingBoing, Mozilla, WordPress, TwitPic, MoveOn.org and the ICanHasCheezBurger network. Search giant Google is showing its solidarity with a protest doodle and message: "Tell Congress: Please don't censor the web," but the site planned no complete blackout. Other sites -- like Facebook and Twitter -- oppose the legislation in question but aren't participating in today's blackout. In addition to the Internet-based protests, some opponents are physically protesting on Wednesday outside of their congressional representatives' offices. Reddit co-founder Alexis Ohanian said in Tuesday's press conference it will "probably be the geekiest, most rational protest ever." There are already laws that protect copyrighted material, including the Digital Millennium Copyright Act (DMCA). But while the DMCA focuses on removing specific, unauthorized content from the Internet, SOPA and PIPA instead target the platform -- that is, the site hosting the unauthorized content. The bills would give the Justice Department the power to go after foreign websites willfully committing or facilitating intellectual property theft -- "rogue" sites like The Pirate Bay. The government would be able to force U.S.-based companies, like Internet service providers, credit card companies and online advertisers, to cut off ties with those sites. Content groups like the Motion Picture Association of America (MPAA), and business representatives like the U.S. Chamber of Commerce, argue that innovation and jobs in content-creating industries are threatened by growing Internet piracy. Overseas websites, they argue, are a safe haven for Internet pirates profiting off their content. According to the Global Intellectual Property Center, which is part of the U.S. Chamber of Commerce, intellectual property-intensive sectors employ more than 19 million people in the U.S. and create $7.7 trillion in gross output. Foreign website operators currently outside the bounds of U.S. law; SOPA and PIPA would help quell illegitimate Internet activity. In a statement, former Sen. Chris Dodd, who is now chairman and CEO of the MPAA, called the blackout day a "gimmick." "It's a dangerous and troubling development when the platforms that serve as gateways to information intentionally skew the facts to incite their users in order to further their corporate interests," Dodd said. CBS Corporation, which owns CBSNews.com, is a member of the Copyright Alliance -- an industry group representing content producers that supports SOPA and PIPA. Internet companies and their investors would readily say that they're holding the "blackout" to protect their corporate interests -- and the entire burgeoning Internet-based economy. "The success of Reddit... is one of the smaller examples of the success that has happened in our industry -- and will continue to unless bills like SOPA or PIPA become law," Ohanian said Tuesday. Under the rules SOPA or PIPA would impose, Ohanian and others argue, start ups wouldn't be able to handle the costs that come with defending their sites against possible violations. Such sites would not be able to pay the large teams of lawyers that established sites like Google or Facebook can afford. The legislation in question targets foreign companies whose primary purpose is to sell stolen or counterfeit goods -- but opponents say domestic companies could still be held liable for linking to their content. While sites like Reddit wouldn't have a legal duty to monitor their sites all the time, "you might have your pants sued off of you" if you don't, said Jayme White, staff director for the Senate Finance Subcommittee on international trade. Brad Burnham, managing partner at the venture capital fund Union Square Ventures, said his company has avoided investing in companies related to the music industry because of the copyright risks -- but under the proposed legislation, that risk would hit just about any Internet company. SOPA and PIPA, he said, "takes the risk of frivolous litigation... to the entire Internet." That should be a concern, Burnham said, when the Internet accounts for 21 percent of economic growth among developed nations, according to one study. The impacts could go beyond the economy, some argue. Rebecca MacKinnon, a senior fellow at the nonpartisan New America Foundation, argues that if blogging platforms are motivated to monitor their content, that could have "a tremendous chilling effect on people tyring to conduct political discourse and trying to use content in a fair use context." Where does the legislation stand? Opponents of SOPA and PIPA celebrated when, earlier this month, authors of both bills decided to set aside the most controversial aspect of them -- language that would have let the Justice Department force Internet Service Providers to block the domains of suspected foreign "rogue" sites. Also, over the weekend, the White House suggested it wants to see modifications to the legislation. The Senate is scheduled to hold a procedural vote on PIPA on January 24. House Judiciary Committee Chairman Lamar Smith, R-Texas, who sponsored SOPA, said Tuesday he expects the committee to continue work on the House bill in February. Rep. Darrell Issa, R-Calif., meanwhile, is opposed to the legislation and will today officially introduce an alternative -- the Online Protection and Enforcement of Digital Trade (OPEN) Act. Issa said Tuesday he expects his bill to have more co-sponsors than SOPA has in the House and that "once members of Congress see a viable alternative... I think we can get to a consensus." The OPEN Act would make the International Trade Commission, rather than the Justice Department, responsible for policing U.S. connections to foreign rogue sites. Placing that responsibility in the hands of one entity, rather than the whole court system, would make the process more transparent, Issa argues.